I received a review copy from the author. This does not affect the contents of my review and all opinions are my own. Back when I reviewed the first Guardians of Aandor novel, I recall that one of my biggest concerns with the story was that the eclectic mashup of high fantasy and contemporary urban elements would play havoc with reader expectations. 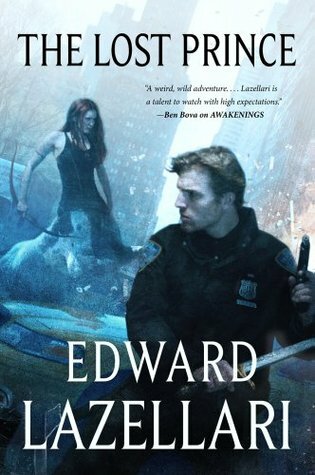 However, with this sequel, the series may have finally found its feet, thanks to clever storytelling by author Edward Lazellari. The Lost Prince picks up immediately after the events of Awakenings. Thirteen years ago, a group of unrelated individuals found themselves waking up with no memory of who they were or where they came from, but in the time since, they have each made a new life for themselves. Granted, some of them were more successful at it than others. A few of them got married and started families. A couple of them even became leaders in their respective communities, or found fame and fortune. And somewhere, a thirteen-year-old boy is on the run, unaware of his connection to all these individuals and to the fact that their lost memories have everything to do with him. But now the dam has broken. Everywhere, our characters are remembering the past and their true purpose: to find and return a lost prince to the alternate dimension they all came from, a feudal medieval realm called Aandor. Thirteen years ago, they were transported to our world in order to escape invading forces from the rival kingdom of Farrenheil, but due to a botched magical spell by the group’s wizard, they all ended up with amnesia. The prince, an infant at the time, was lost in the confusion and was thus raised by a foster family with no knowledge of his real identity or the fact he is the heir to an entire kingdom. Now the boy has grown into a young teen named Daniel, running from the law after killing his abusive stepdad in self-defense. But unbeknownst to him, the police are the least of his worries, for enemies from Farrenheil have recently broken through to this world and will stop at nothing to see the prince dead. Thankfully though, Daniel’s guardians are also on the move. New York City cop Cal MacDonnell was a Knight Captain in his life before, sworn to protect the prince. Together with his wife Cat and wizards Seth Raincrest and Lelani the centaur, they’re following a trail of clues trying to find Daniel first. Around the country, Cal’s allies are also being gathered by his second-in-command Malcolm, a dwarven metalsmith who has considerable pull in this world as CEO of a major defense company. Among the awakened guardians are some of the new key characters like Allyn, a cleric from Aandor who has found a similar calling in this new life as a reverend; Tim, a bard who has also put his past skills to good use by becoming a famous rock musician; and Balzac, a court jester who has come to pursue a less ostentatious career in this world as a college professor. And so, with the party assembled, they all must come up with a plan to rescue Daniel and complete their mission. As you can probably tell from the story’s description, this sequel greatly expands the world of the series, adding more characters, more background lore, and even more incredible new developments in this already complex plot. This book hits the ground running, now that the board has been set and all the pieces are in place. With all the confusion of the previous foundation-establishing novel behind us now, there is a strong sense that we are ready to roll, and the atmosphere of urgency and desperation in the first few chapters seem to back this up. And indeed, having all these characters running around doing their own thing means that we get to cover a lot of ground in this book, zipping from one place to the next before events culminate in New York City for the final showdown. As a result, scene transitions and perspective switches were frequent and plentiful, especially since the author also gave the villains of this story a larger focus in this sequel. The main issue I found with this framework is the same one I commonly have with stories that are told through multiple POVs—that is, inevitably I found some characters more likeable and interesting to follow than others. Surprisingly, Cal, Cat, and Daniel were not among my favorites this time around, given how I’ve spent the most time with them so far, but I just found them very judgey and annoying in this sequel, from Cal’s mean-spirited treatment of Seth (even if the wizard did kind of deserve it) to Cat and Daniel’s snide uppity comments towards non-city folk. Instead, the chapters from supporting characters like Lelani continued to dominate my enjoyment, and I also loved Malcolm and Allyn. It seemed to me that the “new Aandorians” stole the show in this second round, perhaps overshadowing more prominent POVs like Cal, Seth, and Daniel with the novelty of their personalities and backgrounds. As such, the overall reading experience probably did not go as smoothly for me as it could have. I also occasionally felt jarred by the writing, which felt awkward and strained in some sections. The term “more showing, less telling” came to mind often when it came to a few of the characters’ motivations, especially the main baddie Dorn, whose villainy was described to such a degree that it felt almost over-the-top and cartoonish. There were also a couple instances where the descriptions of graphic violence and sexual content became unexpectedly detailed, and while I took no issue with the content itself, I felt that the writing in these sections didn’t quite mesh with the rest of the book in terms of tone and style. There seemed to be more info-dumping this time too, though I wonder if that might be the result of having so many more characters in this book and the need to cover all their backstories briskly and efficiently. In any case, I did have a good time with this sequel, and I continue to be impressed by the mix of epic and urban fantasy ideas found here. To keep things running smoothly, Lazellari has adopted a lot of simple and familiar genre tropes, relying on readers’ familiarity with them to generate interest. His true triumph and this series’ crowning achievement, however, is the blending of all these different and contrasting elements to create a cohesive, imaginative and engaging premise. I couldn’t help but be drawn into this saga, especially with all the human drama. Will the triangle of Cat, Cal, and his relationship with his betrothed Chryslantha somehow sort itself out? Will Daniel fulfill his destiny and be a worthy prince? Will we ever get to see Aandor? All these questions and more need answering, and I look forward to finding out how everything will play out in the last book of the trilogy. Fantastic review Mogsy! I can totally relate with the more showing and less telling and that’s why I always think that writing from multiple POV is really difficult. You have to make the reader feel he is reading about M or Z or and not only because the chapter’s titles begin with M or Z. He has to really walk in M or Z’s shoes and flesh them up so good that they are easily recognizable. It goes wih experiencing emotions etc so showing! On a side note I think this would make a fantastic TV series! You make some excellent points on showing vs telling and also the challenge of juggling multiple POVs. When you have such a huge cast of characters though, it can definitely get tricky. Do you have access to book 3? I went to check out book 3 on amazon and it was $17!!!!!!!!!!!!!!!!!!!!!!!!!!!!! For the ebook version!!!!!!!!!!!!!!!!!!!!!!!!!! Books 1 and 2 were each $8, so I was expecting something more in line with that. Double the price, quadruple my sticker shock. I have a feeling that unless I can get my library to order these that I’m going to be out of luck. I think it’s because book 3 just came out, there was a huge gap between it and the second book. The lower prices for books 1 and 2 are probably because they’ve been out for a while, but yikes, $17 is pretty bad for ebook, even a new release. Geez, that’s more in line with hardcover price, what is the publisher thinking in setting that price? I just checked the publication dates, holy smokes, you weren’t kidding about there being a gap! It’s a wonder he has fans left. Yep, I do love it when a series evolves! It sounds like a very odd story set up, but based on your review it mostly works. I’m surprised to see you reading such an old book, though! As with most UF series, it takes from two to three books for the author to find the right footing, so I hope this one does soon, because I might give it a try, and soon. Sounds like a pretty interesting concept. Glad the sequel improved on it for you. Great review! Sounds like the fantasy version of the Terminator. I hope the series ends on a high note for you – it sounds like the author is pulling together a lot of interesting ideas.